I'm slow to learn of this contest, but it's not too late! It started March 11, but you still have till May 30 at midnight Eastern Time to enter. Dreyer's is holding the Dreyer's Slow Churned Neighborhood Salute. I love this idea. You write up a short essay (350 words or less) explaining why your neighborhood deserves an ice cream block party, and then cross your fingers that your dreams come true and you are selected! If you think this already sounds good, it's about to get better. Get this: Dreyer's is selecting 1,500 (you heard me right, that's a LOT of winners) essays for the grand prize. 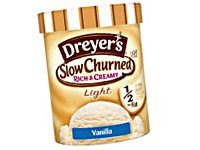 You'll get 12 cartons of Dreyer's Slow Churned light ice cream delivered to your doorstep, 4 boxes of Dreyer's Slow Churned light ice cream bars, and a party-in-a-box, including ice cream scoops, napkins, spoons, nametags, disposable camera, etc...). 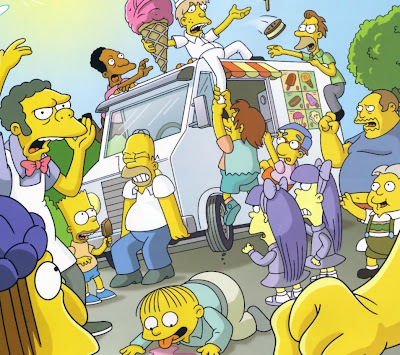 Dreyer's says that's enough for about 100 normal people, but they haven't considered that it would only feed about 10 ice-cream-aholics who don't mind a tummy ache. two comments. who has room for that much ice cream in their freezer. also, nelsons arm looks awfully phallic. anonymous - you're not storing the ice cream if you win. you're eating it right then, with your neighbors. cuz it's a block party, and they're delivering the prize to your doorstep just in time for the party. and NO COMMENT on nelsons arm!